Welcome to Stop 13 of the Consequences Audio Tour! 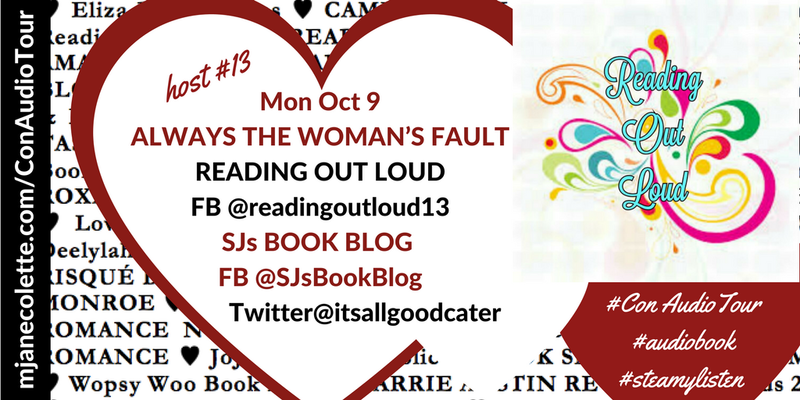 If you’re in a hurry to listen to Chapter 13: ALWAYS THE WOMAN’S FAULT, it’s live on co-hosts’ READING OUT LOUD and SJ’S BOOK BLOG Facebook pages RIGHT NOW! Me: Run run to READING OUT LOUD and SJ’S BOOK BLOG Facebook pages to find out! If you have a few minutes, let me tell you about these two fabulous blogs, READING OUT LOUD and SJ’S BOOK BLOG, co-hosts for Chapter 13 of the Consequences Audio Tour, cause I’m so happy that they’re hosting my lucky number 13 chapter–I love the number 13, btw, my superstitions about it are all POSITIVE. Teri Hicks is one of the master (mistress?) minds behind these two (and other!) blogs, and she and her partners are enthusiastic readers, bloggers, promoters and advocates of authors, romance and other genres alike. When I approached Teri, so very tentatively and shyly, because we had not worked on anything together before, about taking part in the Consequences Audio Tour, I suggested that maybe one or another of her blogs could just share some info about the tour at some point as it unfolded? Maybe? Please? Instead, Teri offered to host a chapter on two of their platforms! Because she is AWESOME. So, I hope their readers (and of course, you) enjoy the “Always The Woman’s Fault” chapter, in which… goddammit, I can’t tell you anything about this book. Everything’s a spoiler! Visit & Like SJs Book Blog on FB. And follow Teri Hicks on Twitter & Good Reads! Thank you, Teri and co. and Reading Out Loud and SJ’s Book Blog !